Grizzly Jig Company - Grizzly Jigs-1/80 oz. 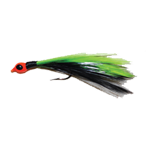 Jigs & Bait → Grizzly Jig Company → Grizzly Jigs-1/80 oz. Options: 3 Pack 1/80 oz. Dozen 1/80 oz. Hand tied on a size 10 dry fly hook. The jig and technique worthy enough to write a book about. See Grizzly Fishin' by Tim Huffman and the new Grizzly fishing video. Available in 3 pack or by the dozen.